Have a neon-lit sign and wish you had an LED sign? Dale Sign Service can help you retrofit your neon-lit channel letters and neon pole sign cabinets with LEDs. LED signs are the way to go when you want to advertise your business or promote your brand. Neon-lit signs used to be the only way to display lighted signs outdoors, but converting your LED signage in St. Charles and St. Louis, Missouri can offer some great benefits. More efficient: LED lighting is more than 90% more efficient than neon lighting. Higher efficiency lighting results in lower electricity costs. LED lighting also does not burn as hot as neon lighting. LED lighting therefore reduces the environmental impact of advertising your business. Durable: LED modules are made of plastic and are easier to maintain and clean, whereas neon letters are made of glass. Because neon is made of glass they are more fragile, and they burn hot so are harder to maintain and clean. 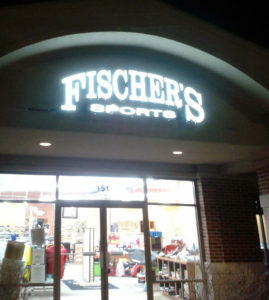 Easy installation: LED channel letters require smaller pass-through holes into your building or structure. That makes retrofitting neon letters with LED letters easy. Better performing: LED lights are more consistent and do not have issues with flickering the way neon signs can develop. That means LED lights last longer than neon lights. Brighter: LED lights are brighter than neon lights and do not fail at colder temperatures the way neon lights do – LED lights also keep their brightness better over the course of their lifetimes than neon lights. 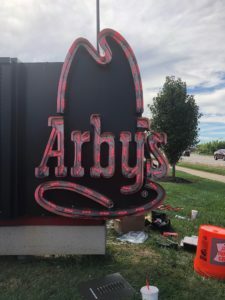 Retrofitting your neon signs with LED lights means that your St. Louis exterior signage isn’t as prone to temperature issues as traditional neon signs. Dale Sign Service can use your existing channel letters to put the LED lighting in place. The installation is quick and easy! When you retrofit a pole sign cabinet with LED lighting, you get a cleaner, more modern look than a neon sign gives you. Contact us to find out how we can retrofit your existing neon sign!